For any corporate company, B2B Payments services are an increasingly important source of revenue and driver of loyalty. Expectations around the efficiency and convenience of payments are growing fast. For consumers, advances such as mobile and contactless payments have transformed the payments experience. Even in today’s digital era, corporate payment processes are still paper-based, old-fashioned and inflexible, with manual processes still prevalent in reconciliation between purchase orders, goods received notes, bank accounts, Accounts Receivable, Accounts Payable, and customer contracts. In many corporates, manual checks are also needed to verify the legitimacy of clients, trading partners and goods changing hands. These physical processes are difficult and costly to change to boost efficiency or comply with new regulations. Effective reporting is key in trade, treasury or any payment transaction. And corporates need to monitor and report on payments data in many ways—financial, non-financial, regulatory, commercial, and more. Yet siloed systems and fragmented payment processing mean payments data is often captured in different forms and in different systems, leading to errors, inefficiencies, and higher headcount. Banks continue to focus on large scale operations. The inability of the banks to consumerize new banking technologies with the help of software products/ tools which cater to the needs of current businesses. Payment technologies like UPI in India are currently open only to the B2C segment will further drive adoption of Digital Payments when rolled out to the B2B segment. Businesses use spreadsheets, email & Bank Current Account or cheques or cash to manage day to day operations. Payments being an integral part of Financial Operations remained disconnected from current processes. How Can Finly Help to win out B2B Payments? Managing corporate payments is not simple, especially when data & technology is scattered across disparate sources and the processes are manual. – Directly capturing digital transactions processed through banking APIs & from payment instruments (Prepaid Cards, Wallets), which are used to transact by the Employees. – Cash transactions are captured via OCR. ‎Verify: Monitor these transactions against company policies and have them manually verified if necessary. Process: Process timely payments to vendors, reconciliation of advances, reimbursements & track collection of receivables. ‎Report: Deliver reports on these transactions to concerned stakeholders. Finly, a cloud-based Finance Management & Governance System is enabled with multiple Payment Instruments which have been achieved by partnering with multiple banks & payment partners. Gaining real-time visibility into cash. Improving cash management decision-making with cash positioning and forecasting. Managing multiple bank relationships from a central point. Achieving compliance with capabilities that enable segregation of duties. Improving cash pooling, sweeping and zero-balancing. Finly enables the various stakeholders involved in each of the transaction (Spender/Reviewer/Finance Teams/ Vendors) to communicate & collaborate while also providing complete visibility to the Finance Team. • An easy to use, a configurable system which scales along with the business to manage all Business Spend & Revenue. • An integrated payment interfaces allowing transactions to be automatically recorded while reconciling the same with their respective invoices/ receipts(OCR). • An automated repetitive tasks carried out by the finance team ( some ML here). • Providing complete real-time insights into Business Spend (Travel Expenses + Petty Cash Expenses + Procurement) against the Revenue earned for the Projects/ Cost Centers/ Departments/ Categories. • Microservice architecture allowing us to integrate & work with all existing business systems. While we promote Digital Transactions we provide complete support for handling cash transactions, as we understand businesses transacting with a network of Vendors/ Employees cannot make this shift overnight. 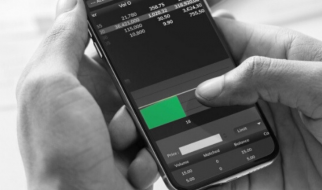 This change is going to be a gradual transition for the business and the idea of digitally transacting needs to be cross sold to the business. As payments are always between 2 or more parties, B2B payments has a huge potential of creating a network effect. Let’s take a business having 300 employees. This business would be transacting with over 50 Vendors. During this phase B2C segment was constantly going through a major digital transformation (access to multiple apps, new payment technologies such as UPI, demonetization etc), fundamentally changing how consumers transact. However, we observed that businesses continued to rely on traditional methods for handling & processing payments. Banks continued to focus on large scale operations. Inability of the banks to consumerize new banking technologies with the help of software products/ tools which cater to the needs of current businesses. Payments being an integral part of financial operations remained disconnected from current processes. Further, payment technologies like UPI which are currently open only to the B2C segment will further drive adoption of Digital Payments when rolled out to the B2B segment. 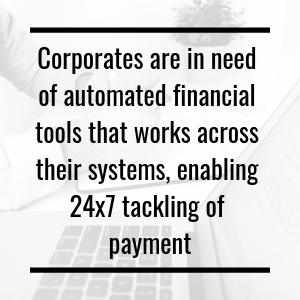 We believe the next generation of Finance teams would not be spending time on manual work carrying out their day to day operations of making vendor payments, reconciling invoices, tracking advances etc. They would be performing critical tasks of analyzing & tracking key metrics relevant to the company’s growth. An impressive share! I’ve just forwarded this onto a co-worker who has been conducting a little homework on this. But yeah, thanx for spending the time to talk about this subject here on your website. Its such as you learn my thoughts! You seem to grasp so much about this, such as you wrote the book in it or something. I think that you simply could do with a few percent to power the message house a bit, but instead of that, this is fantastic blog. An excellent read. I will certainly be back. Thanks for finally writing about >B2B Payments – Challenges And Solutions For Corporates <Loved it!! your RSS. I don’t know why I cannot join it. Is there anybody having similar RSS issues? Anyone that knows the answer will you kindly respond? This article is truly a pleasant one it assists new internet viewers, who are wishing in favor of blogging. I am in fact glad to glance at this website posts which consists of tons of helpful facts, thanks for providing these information.